Today is a special day at Metro United Way. Every year, on February 11th (2/11), we celebrate 2-1-1 Day! It's an opportunity for us to reflect on all of the good things that Metro United Way's 2-1-1 service does to help people in our community. 2-1-1 connects people with resources to help them face life challenges, often for the first time, to the appropriate service provider. This easy to remember phone number saves time and frustration by eliminating the need to navigate a maze of agencies and help-lines. 1. 2-1-1 is available 24 hours a day, 7 days a week and 365 days a year. Whether you call 2-1-1 on a holiday, in the middle of the night or during a snowstorm, someone will always be available to take your call. Don't want to pick up the phone? You can also use the 2-1-1 Community Resources Database which allows you to search online for answers. 2. More than 360,000 people have called 2-1-1 or used the online 2-1-1 Community Resources Database Search since the service started. Last year alone, 2-1-1 helped over 66,000 people find the help that they need to tackle a personal issue or a family crisis. 3. You probably already know that 2-1-1 provides referrals to organizations that helps meet basic needs, but you might not know that 2-1-1 goes far beyond that. Need to find childcare near your home? Need to help your kids keep their educational goals on track? Need to find an independent living or assisted living services for an aging parent? 2-1-1 is a single number to call when you don’t know who to call. 4. Metro United Way's 2-1-1 service is completely FREE. And you just can’t beat free. 5. You can connect to 2-1-1 from 12 different counties in our area! 2-1-1 covers the Louisville Metro including Jefferson, Bullitt, Carroll, Henry, Nelson, Oldham, Shelby, Spencer and Trimble Counties in Kentucky. It is also available in Clark, Floyd and Harrison Counties in Southern Indiana. In fact, on a national basis, more than 90% of the country has 2-1-1 service. 6. When you dial 2-1-1, you will be connected with a trained representative who will direct you to resources to help and keep your information completely confidential. The call specialists truly listen so they can help you find the specific help that you need. 7. 2-1-1 is multilingual and has available translation services for over 100 different languages by bringing a translator on to any call. 8. There is an 1-800 alternative number as well! 2-1-1 is available as a three-digit dial (similar to 911) from most phones. But, if 2-1-1 is not available from where you are, you can dial 1-877-566-4968 and reach the exact same help. 9. You can connect to 2-1-1 from just about any cell phone. 2-1-1 is available through Verizon, T-Mobile, Sprint, AT&T and Cricket mobile carriers. 10. 2-1-1 is coming to your smart phone in 2014! 2-1-1 service will soon be available through a new app for your mobile device. 11. 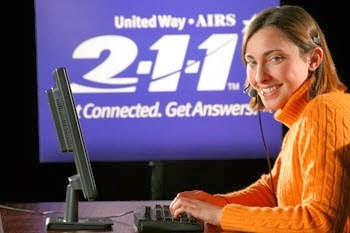 Finally and most importantly, Metro United Way's 2-1-1 service saves you from calling multiple places, searching endlessly online or combing through the phone book. We're looking forward to celebrating many more years of 2-1-1 helping people in our community get connected and get answers. Glen Powell is Metro United Way's 2-1-1 Director and helped start the program at Metro United Way due to his knowledge of the vast resources and services in our community ranging from government agencies to non-profit organizations. Glen is a retired Louisville Police Office, a Military Reservist and a Veteran with recent tours in Iraq in 2007 and Guantanamo Bay in 2012. He was the first person at Metro United Way to be activated to duty in our 90 year history. Thanks - by reading this post I have learned two new things about our awesome 211 service - translation is available in over 100 different languages and we will soon have an app for mobile devices - very cool!! And very comforting to know that 211 is avaialble 24/7 to call when you are struggling but don't know where to start. Wow! That's quite the impressive list. Happy 2-1-1 Day everyone!